The payout increases once more, as does the main lap counter. This time the winner will take home a check for $10,000. In addition, this is the first series points paying night of the week for the Lucas Oil Late Model Dirt Series, tonight really matters. Billy Moyer Jr and Devin Moran set row one in the first heat race of the night. Green, Moran leads into turn 1. He hits the cushion. Moyer Jr isn’t letting him get away. Lap 2, Moyer gas a run off turn 2. He dives to the inside in turn 3 and completes the pass in turn 4. Moran gets sideways back in turn 2, all on his own. 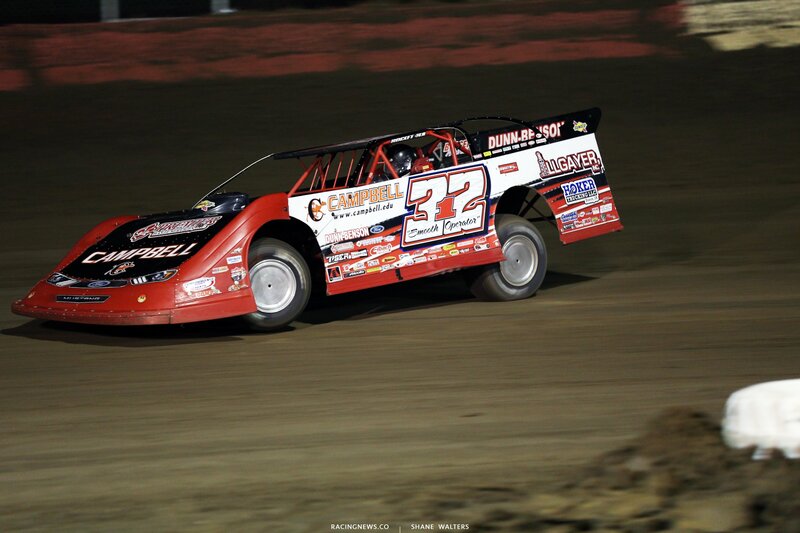 Moyer Jr drives away to win the first heat race of the night. Earl Pearson Jr and Tyler Erb trail the pace truck. Pearson slides Erb in turn 1. Pearson catches the cushion but Erb is already turned down the back. Erb returns the slide in turn 3. Pearson slides him again back in turn 1. The caution is out. Hubbard is stopped on the front. Green, Pearson leads into turn 1. He leads by five car lengths. Caution, slow car down the back. Moriarty has lost power. Green, Pearson leads by two at the flagstand. Erb is under fire from Boom Briggs. Pearson drives off to win heat race number two. Bobby Pierce and Tim McCreadie will lead them to green. Pierce gets the jump. 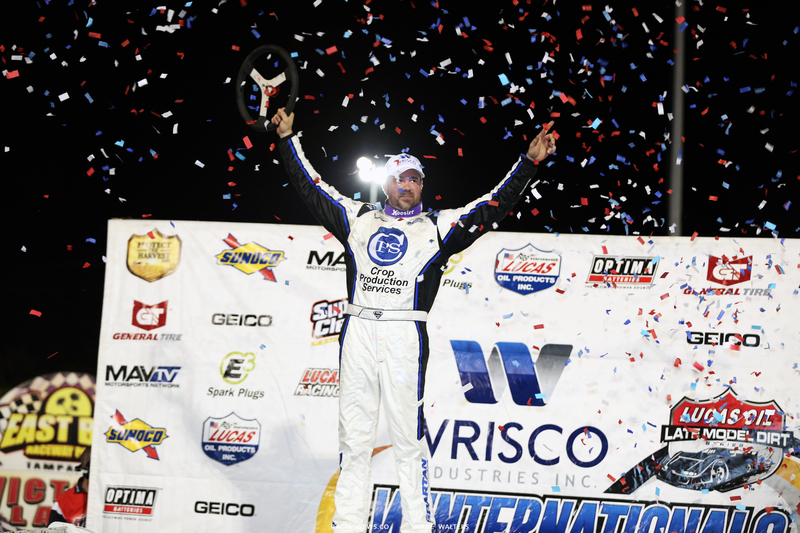 He carries the momentum all the way down the front stretch. Pierce leads by a car length into turn 1. McCreadie loses ground early but he gains it all back. 1 to go, they run nose to tail off turn 2. McCreadie select the cushion in turn 3, Pierce to the bottom. Pierce gaps him by four car lengths coming the line. Both of these guys have had a rough speedweeks thus far. They runs first and second. Pierce wins. Josh Richards and Dennis Erb Jr line up on the front row. Green, even through 1 and two. Richards gets the drive off turn 2 on the bottom. Richards leads into turn 3. Caution. Green, trouble in turn 3. 2 laps complete. Green, bumps have formed in turn 1. Erb, Overton and Hudson O’Neal elect to launch through them. Laps later, all 3 have found a way to avoid them. Josh Richards drives away to win heat race number four. Kyle Bronson and Jeff Mathews trail behind the pace truck. Green, Bronson jumps right to the cushion in turn 1. Satterlee is looking low but Bronson pulls away. Lap 8, Satterlee has fallen to the front bumper of Bloomquist. They run side by side though turn 1. Still side by side. 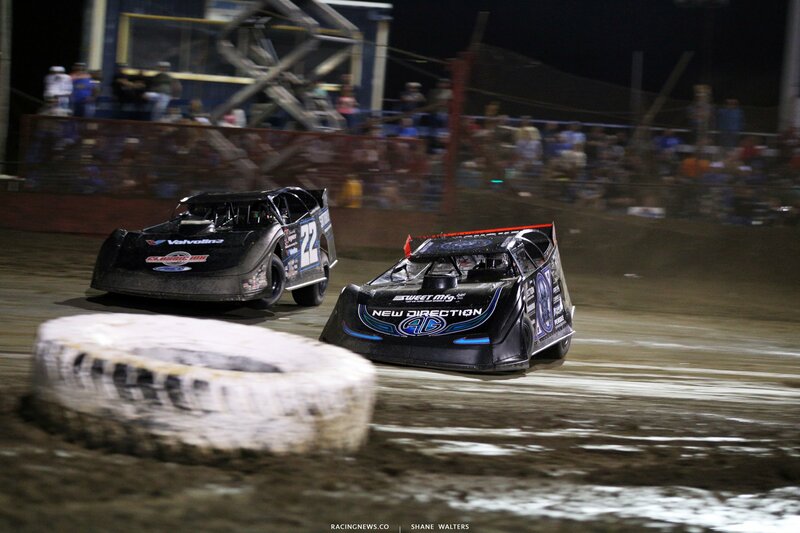 Bloomquist loses ground. Last lap, Bloomquist dives to the bottom in turn 1. Bronson wins it. 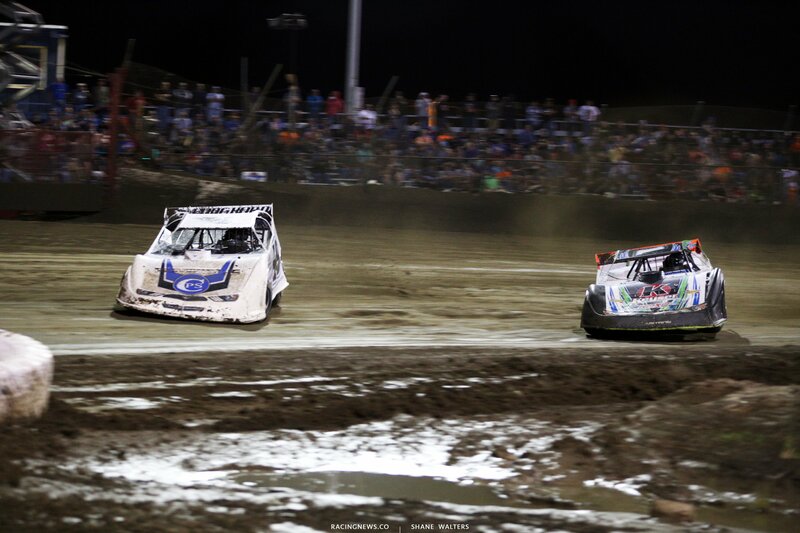 Satterlee leads Bloomquist to the line by a 1/2 car length. Matt Cosner and Darrell Lanigan set the first row in the final heat race of the night. Green flag, from row two, Davenport slices the front row. Davenport is up to 2nd out of turn 2. He’s under Lanigan into turn 3. Davenport to the lead in turn 4. In one lap, Davenport drives to the front. He’s gone. Davenport wins the 6th and final heat race. Chub Franks win B Main number one. 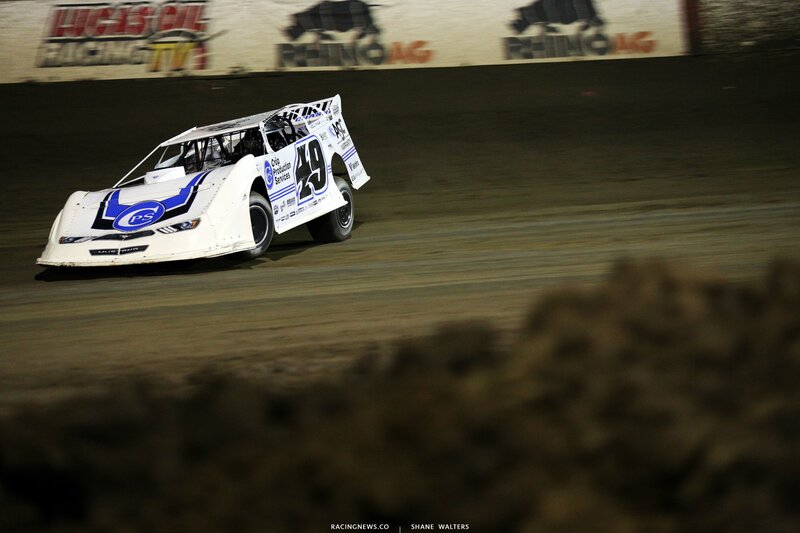 Last nights winner, Brandon Sheppard transfer through to the main by finishing 2nd. Brandon Overton, another main event winner from the week was relegated to a B Main tonight. He drove to the win in B Main number two. Matt Cosner, Jimmy Owens and Hudson O’Neal have been gifted with provisional starting spots in tonights main event. The 4 wide salute rolls by the packed Tampa grandstands. The green is next. 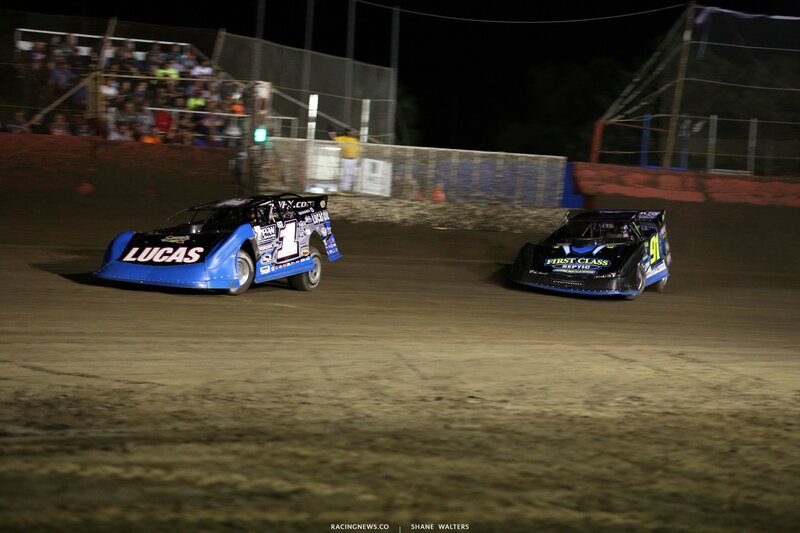 Billy Moyer Jr and Josh Richards will lead the field to the green flag. Green flag, side by side into turn 1. 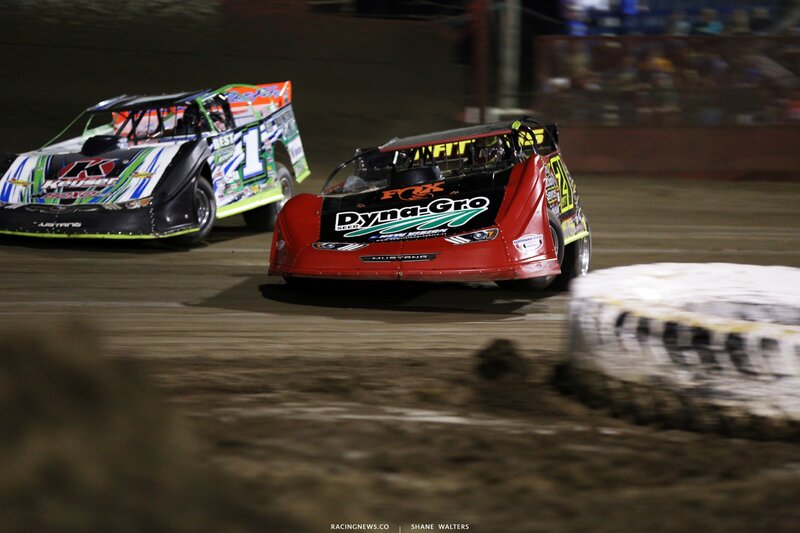 Moyer noses ahead at the entry. Richards catches the cushion. Richards carries more speed off turn 2 and leads into turn 3. Lap 5, Moyer has caught Richards. He looks high in turn 3. At the line, Moyer has the lead. Lap 7, Richards is under Moyer into turn 1. He drives it 20 feet deeper into the corner. Moyer is making is all up on exit. They comes off turn 2 door to door. Richards dives it deep into turn 3. This time he maintains the gap. Richards is clear by 7 car lengths. Lap 11, Lanigan is up in smoke. The caution is out and he heads to the pits. Bronson went to the pits too but comes back on track. Green, Richards checks out. The race is for 2nd. Most of the field is glued to the inside of the race track. They all run through the bumps in turn 1. McCreadie and Pierce are experimenting with the cushion, they’re the only ones. Lap 29, Pearson is under Davenport for 2nd into turn 1. Davenport hits the cushion, he’s aggressively trying to get that position back. Lap 31, the caution is out. Chase Junghans is slow on track. Green, Billy Moyer Jr hits a ramp in turn 1! His left side was 3 feet in the air. He gathers it back up but they’re 4 wide and al going around him off turn 2. Meanwhile, Davenport is looking for the lead! He’s in front of Richards on the highside. Richards again powers even to him on the exit. Davenport is looking high in turn 3. He’s nearly there, Richards shuts the door. Davenport thought about crossing under him in turn 1. Instead he lifts and enter behind Richards so he can stay on the top. Richards opens a gap to Davenport. It’s erased! 3 to go, Davenport drives around Richards on the highside. He’s clear by two car lengths. Davenport is driving away. 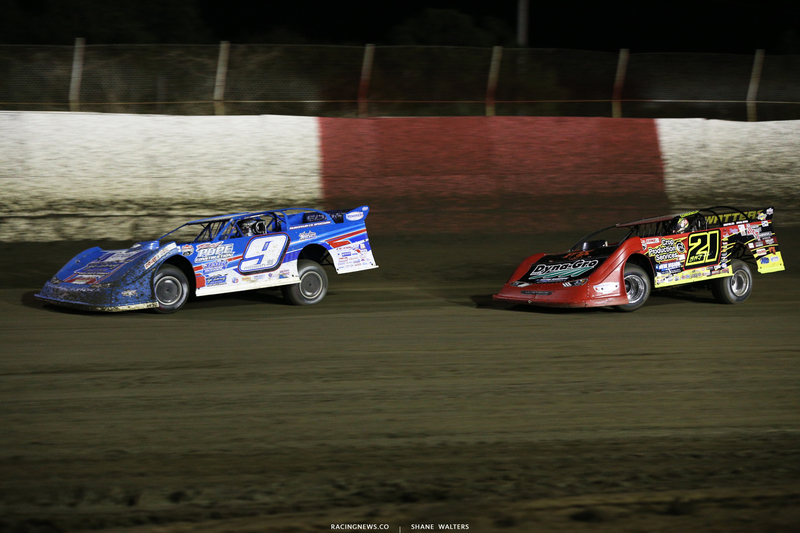 Jonathan Davenport wins at East Bay Raceway Park! Tomorrow night, the week of racing at East Bay Raceway Park comes to a close. The 60-lap main event will pay $12,000 to the LOLMDS feature winner. On Sunday, the tour heads to Ocala, FL where they’ll unload at Bubba Raceway Park.